CHICAGO – The issue of mental health is given a celestial spin in the short film “Miriam is Going to Mars,” written and directed by Michael Lippert of Cutters Studios in Chicago. The film recently was the Grand Jury Winner at the Midwest Independent Film Festival “Midwest Advertising Community Shorts Night,” and follows that up with a screening at the Ithaca (New York) Fantastik Fest on November 11th, 2017. Miriam (Anne Sonneville) is a mother on the edge of a nervous breakdown, due to severe schizophrenia… literally hearing voices in her head. After this condition puts her son in danger, she is institutionalized, and constantly wears noise reduction headphones to soften those urgent voices. In her rehabilitation, she comes upon a video submission contest that applies for the first manned mission to Mars. She focuses enough to complete the application, and waits for the results. Michael Lippert is the writer/director of the film, and is an editor at the post production house Cutters Studios. 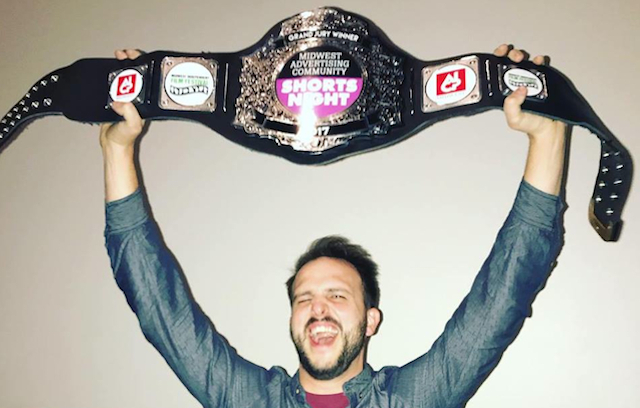 He used a crew of fellow advertising and commercial video workers to complete his film, and is currently submitting it on the festival circuit. In the following Podtalk, Michael Lippert talks about the mental health issues he is depicting in “Miriam is Going to Mars,” the unique sound design and the it-takes-a-village cooperation he received in producing the short. ”Miriam is Going to Mars” is part of the Short Film Competition at the Ithaca (New York) Fantastik Fest on November 11th, 2017. Featuring Anne Sommeville. Written and directed by Michael Lippert. For details, click here.